Description (from Google): In an attempt to escape his past, Sean Thornton (John Wayne) returns to America to reclaim his homestead. Once he is home, his eye is caught by Mary Kate (Maureen O’Hara), a poor maiden with an ill-tempered older brother named Will. Their relationship is constantly on attack by Will (Victor McLaglen), which forms the main plot line, with Sean’s past as the undercurrent. Here’s what I got out of this movie: I’m super attracted to John Wayne in a tailored suit and I will now need to watch all of his westerns to see if I feel the same way about him in cowboy attire. Also, while I loved Maureen O’Hara in the original Parent Trap, I did not care for her in this movie. 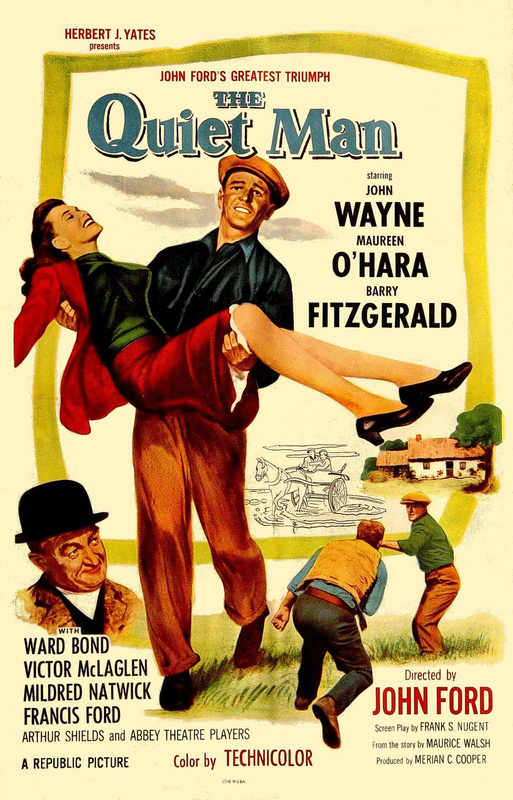 She was scared whitless of this man (John Wayne’s character Sean Thornton), then he kisses her once (without any prompting or permission) and suddenly she’s in love with him. I realize there probably weren’t a ton of character options for women back in the 50’s, but I mean, COME ON! Of course, it could have just been the tailored suit she was so enamored with, in which case, I semi-forgive her. After watching the film, I read the trivia section on IMDb, as I always do, and found out that the studio wanted the director (John Ford) to cut at least 9 minutes out of the movie to get it under two hours and he argued that he’d already trimmed all the fat. Well, I’d like to argue with him on that. There were so many gratuitous shots of green valleys and hills, and superfluous minor characters that he could have EASILY cut another 15-20 minutes from this film and not lost a bit of story. I agree with the studio, it was TOO long. I mostly enjoyed it, except for the length and the terrible Mary Kate character, but I doubt I’ll watch again. I watched it because it was supposed to be romantic, but I didn’t get that at all.